While 27-inch monitors may be too big for some, they are too small for others, for me – they’re the ideal size. Luckily for me, it seems that most of the monitors out there are in fact 27 inches big! We alone have reviewed over fifty 27-inch monitors here and can thus narrow down your choices to only the finest of them. Apart from listing the monitors, we’ll also go into the details of each and every one, so that you may be certain that you’ve picked the right panel, refresh rate, and resolution for your needs. In addition, we’ll single out and highlight all the important and unique features of each monitor. The 27-inch monitors appear to be most popular among both gamers and designers due to the diversity of possible specifications since most resolutions, including 1080p, 1440p, and even 4K can look fascinating on a screen of such size, some more than others. FPS gamers gain a better and broader view which can help them spot enemies lurking from the corners or above the sky. On the other hand, some MOBA players may prefer a bit smaller screens as they depend on mouse movement, who can also check out our best 24-inch monitor list, although that depends on each player individually. Some of the most exciting gaming monitors scheduled to be released this year are 27-inch, such as the Acer Predator X27 and the ASUS PG27UQ which will be the very first monitors to feature the 144Hz refresh rate at the 4K resolution with G-Sync HDR support. Until they are released and we get to check them out as well as many other monitors we’re anticipating, these are the best 27-inch monitors available today. Panel Choice: IPS, TN, or VA? As you can see, gaming monitors take up most of the list because there are so many different versions and models of monitors from the same series, yet only one can be the perfect one for you. First, you should decide on what kind of panel do you want. TN panel monitors offer the best response time speed of 1ms which is mandatory for the high-end professional gamers as they need their fast-paced action to be motion blur-free with no signs of ghosting or trailing of the fast moving objects. IPS panel monitors, on the other hand, can deliver up to 4ms response time speed which is quite satisfactory for casual gaming; in fact, the rarely visible ghosting is only troublesome to the professionals while others players can neglect it and enjoy other perks of IPS panel monitors. Besides the impeccable color accuracy and consistency, the IPS panel monitors also deliver perfect viewing angles of 178 degrees both horizontally and vertically while TN panel monitors have less vibrant colors and their viewing angles max out at 170 degrees. This means that you will have to tilt the screen of the monitor each time you wish to lay on the bed and watch a movie as colors become contrasted when viewed from different angles. If you’re a professional player, this wouldn’t bother you as the image quality will remain perfect as long as you’re sitting in front of the monitor. More importantly, you’ll have the smoothest gameplay experience in the competitive FPS gaming. Lastly, if you’re looking for a curved display, you’ll most likely have to opt for the VA panel. These panels produce a similar image quality and performance as the IPS, albeit with a bit less accurate colors, but the viewing angles and response time speed are almost identical. Moreover, VA panel monitors have a superior contrast ratio for a better relationship between the dark and bright images. The next thing you should consider after you’ve decided on a panel type is the monitor’s refresh rate. 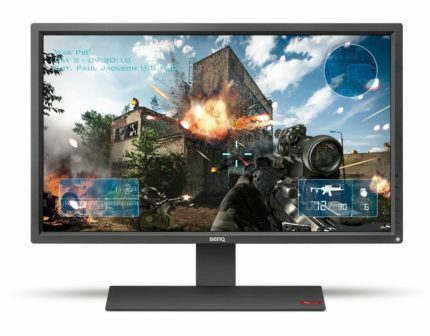 There’s a world of difference between the 144Hz and 60Hz gaming monitors, especially if you’re playing competitive FPS games. In comparison to 60Hz monitors, the 120Hz+ refresh rate allows the image to be refreshed two times faster which results in a huge advantage in competitive games. When you add the input lag into the equation, a 60Hz monitor would make you shoot at the target which isn’t quite where it appears to be but rather a few frames behind. Naturally, you won’t noticeably benefit from the higher refresh rate in turn-based video games and alike, so pick your gaming monitor according to your choice of game genres. We have also excluded 120Hz gaming monitors from the list since they’ve been discontinued and/or replaced with the more popular 144Hz gaming monitors. Nowadays there are even up to 240Hz gaming monitors, but for now, they are only available on differently sized monitors. As far as 27-inch monitors go, 165Hz overclocked is the maximum so far. The difference between the 144Hz and 165Hz isn’t nearly as perceptible as it is with 144Hz vs 60Hz monitors; in fact, most of the users won’t even be able to notice the difference. So, if you already have a 144Hz gaming monitor, it’s not worthy to upgrade your monitor solely for the better refresh rate unless you’re a high-end professional gamer. If you are upgrading from a 60Hz standard monitor, you might as well go straight for a 165Hz monitor since their price is pretty much the same as 144Hz monitors nowadays. Another thing that you should consider when purchasing a gaming monitor is the adaptive sync technology. Whether it’s AMD FreeSync or Nvidia G-Sync, this technology synchronizes the frame rate of your graphics card’s GPU with the monitor’s refresh rate allowing it to function dynamically. This results in a more steady FPS (Frames Per Second) rate, decreased input lag, and elimination of screen tearing and stuttering. To enable this feature you must have either a G-Sync compatible Nvidia graphics card or a FreeSync compatible AMD graphics card. A FreeSync monitor, for example, will be able to work with a Nvidia graphics card in general, but you won’t be able to activate the adaptive sync. Besides offering the extra Ultra Low Motion Blur feature, G-Sync also usually provides you with a wider dynamic range depending on the model of the monitor. However, it also costs more, sometimes up to $200-$300 more than a FreeSync version of the same monitor. It’s arguable whether the difference in the price justifies the amount of gameplay enhancement G-Sync has over FreeSync. The bottom line is that if you already have a more expensive and premium Nvidia graphics card, you’ll most likely want to use it to its full potential and invest into a G-Sync monitor. If you’re purchasing both a new monitor and a new graphics card, consider AMD’s FreeSync as a cheaper alternative with almost identical performance enhancement in video games, but mind the dynamic range. Once the frame rate drops between the dynamic range, the adaptive sync will stop working. Screen Resolution: 1080p, 1440p, or 4k? Once you’ve decided on the right panel for you and whether you need a high refresh rate monitor and the adaptive sync, you should choose the right resolution for your needs. The Full HD 1080p resolution on a 27-inch monitor provides a pixelated image quality due to low pixel density which can repulse some viewers while appealing to others; the pixelated image can increase precision in FPS games such as CS: GO. The WQHD (2560×1440) resolution, also referred to as the 1440p or 2K, is the most popular resolution for 27-inch monitors, it produces a highly detailed image with plenty of workspace. The difference between these two resolutions is quite prominent, and so is the price. Additionally, you need a more powerful computer equipment to run video games at 1440p. Lastly, the 4K UHD resolution monitors have become much more affordable lately, and they offer a stunningly stellar image quality and enormous workspace that you will have to scale up on 27-inch monitors which will, therefore, result in a strikingly detailed image quality. Finally, let’s get into the details of each monitor individually. This goes without saying, but be sure to check and research what kind of computer equipment is required for a smooth experience with your new monitor before purchasing it. If you think we’ve missed on a great 27-inch monitor or have any questions, let us know in the comments below. Until then, we’ll keep the list updated with the latest releases and news. The Acer Predator XB271HU and the ASUS ROG Swift PG279Q are not only the best 27-inch gaming monitors, they are also the best 1440p gaming monitors available at the moment. They will certainly remain on the throne of the best 27-inch gaming monitors until the mentioned 4K 144Hz monitors are released, but even after that, they will still be the best choice for years to come until the high price of the upcoming monitors drops as well as until the computer gear requirement for 144Hz at 4K becomes more available. Both of these monitors feature the same IPS panel with the impeccable viewing angles, a wide color gamut that covers 100% of the sRGB color space, and 4ms response time. In the OSD settings, you can effortlessly overclock them to 165Hz and use some unique gaming features such as the custom crosshair overlays, FPS counter, and a timer. Both monitors have one DisplayPort, one HDMI, the headphones jack, and 2x2W built-in speakers. The main difference between these two lies in their design. Both monitors are VESA mount compatible and can be tilted, rotated, swiveled, and height adjusted, however, the Acer XB271HU PC monitor offers additional 30mm of height adjustment and 15 degrees for tilting, but it has a slightly less stable stand. The ASUS PG279Q display, on the other hand, has a more user-friendly OSD, a better calibration straight out of the box, and an overall slightly thinner bezel. Another difference is that the Acer XB271HU has four USB 3.0 ports whereas the ASUS PG279Q has only two. Since both of the monitors are available for the same price, you can make your decision between the two by getting a monitor which is on sale or simply pick the one that appeals to you more. The stunning image quality and the smooth performance is guaranteed by both, so you don’t have to worry about making the wrong choice. For a more thorough comparison, you can check out our Acer XB271HU vs ASUS PG279Q article. 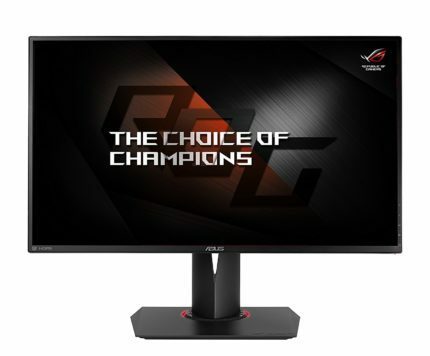 The ASUS PG278QR is essentially the same model as the previously described ASUS PG279Q G-Sync monitor except that it features a TN panel instead of IPS which makes it more suited for competitive gameplay. With only 1ms response time, you will experience the least possible amount of ghosting, trailing, or juddering of the fast moving objects which will give you the edge over your opponents in professional FPS gaming sessions. However, if you prefer less competitive, single-player FPS games and RPGs, then a monitor with an IPS panel is the better choice for you. 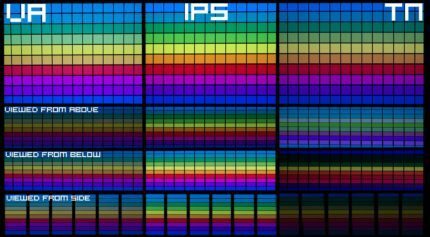 The ASUS PG278QR display features an 8-bit TN panel that covers 100% of the sRGB color space which means its colors will be more vibrant than most of the TN panel monitors out there, but still not quite as rich and accurate as the IPS. The viewing angles amount to 170 degrees horizontally and 160 degrees vertically, but since the monitor offers plenty of ergonomic functionalities, you will certainly be able to properly adjust it in order to enjoy flawless viewing experience for almost any angle or distance. More importantly, you will have a gaming machine that offers the most fluid and smoothest gameplay experience possible. 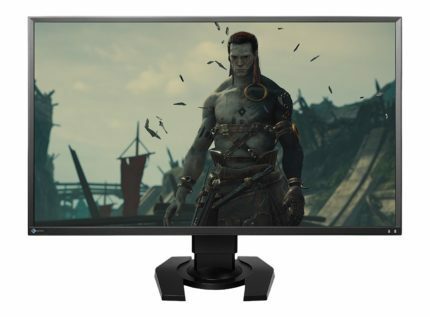 If you’re looking for more affordable gaming monitors that will keep you on par with your opponents, the best choice is to opt for FreeSync monitors. Unlike G-Sync, FreeSync monitors don’t cost extra because of the adaptive sync feature yet they offer an arguably identical improvement to the gameplay performance. However, the G-Sync monitors also come with a feature called Ultra Low Motion Blur which can further decrease motion blurring but cannot be activated at the same time as the G-Sync. The ASUS MG278Q is the same model as the previous two ASUS monitors except that it maxes out 144Hz, features FreeSync instead of G-Sync, and has an extra HDMI port. The key specifications such as the 1ms response time and the 1440p resolution are identical and so are the connectivity and ergonomic options, but it is significantly cheaper. An even cheaper alternative is the Acer XG270HU which offers the same performance and image quality, but it cannot be height adjusted. The Acer XG270HU PC monitor has a DisplayPort, an HDMI, and a DVI port. The Acer XF270HU and the ASUS MG279Q are the same models as the title-holders of the list except that they cannot be overclocked to 165Hz but max out at 144Hz, and they feature FreeSync instead of G-Sync which also make them much more affordable. The response time, gaming features, connectivity options, and design attributes are all the same. 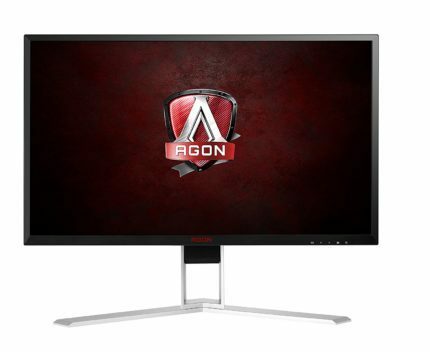 It’s apparent that as far as gaming monitors are concerned, there are actually just a few same model monitors with a different combination of the key specifications such as the panel type, resolution, and the adaptive sync. Hopefully, this list makes it all a bit clearer and allows you to choose a monitor with the perfect specifications for your needs. Not only are the 1080p monitors significantly cheaper than the 1440p ones, the computer requirements to play video games at high quality at 1080p are much more affordable as well. If you’re on a tight budget but would like a big 27-inch monitor that also features 144Hz, the ViewSonic XG2701 is the most budget-friendly option. In addition to high refresh rate, it offers FreeSync, 1ms response time, and other cool gaming features such as the black stabilization which increases the visibility in the dark scenes and the Game Mode which consists of pre-calibrated picture presets for FPS, MOBA, and RTS genres. 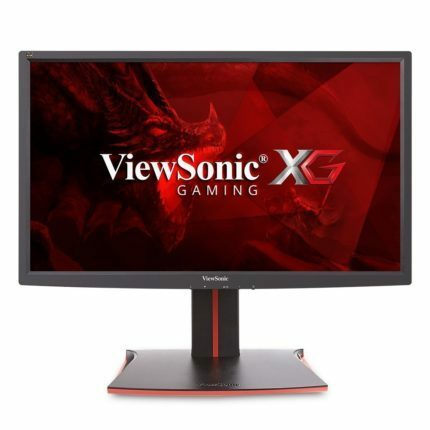 The ViewSonic XG2701 FreeSync monitor has an ergonomic design with a gamer-inspired appearance with the headphones hook, extra USB ports, one HDMI, and one DisplayPort. When it comes to image quality, colors are a bit less expressive than with the more popular ASUS and Acer gaming monitors, but the performance is top-notch. For those out there who have powerful Nvidia graphics cards and want to make full use of it while spending the least possible amount for a high-end competitive monitor, there’s the Acer Predator XB270H. It features G-Sync, rapid 1ms response time, 144Hz refresh rate, and trademark Predator series gaming features. Additionally, the Acer XB270H monitor has four USB 3.0 ports, one of which has battery charging. The design and ergonomics are identical to other Predator monitors, but it has only one DisplayPort. There’s also a FreeSync version of this monitor with an extra HDMI port, the Acer XF270H. Yet another Acer Predator monitor makes the list, but this time from the Z1 series. This cutting-edge gaming monitor, the Acer Predator Z271T, features a VA panel with a superior static contrast ratio at 3,000:1 and a rapid 4ms response time, a 1800R curvature for a more immersive gaming experience, and the built-in Tobii eye-tracking technology. The eye tracking feature consists of a camera that tracks your eye position and helps you react faster in competitive FPS games once you get a hold of it. There are over 40 games that support this technology, so if your favorite game is among them, the Acer Z271 1080p monitor could revolutionize your gameplay experience. Alas, the resolution of this bad boy is only 1920×1080 which may repulse some consumers. Other features include 2x7W built-in speakers, four extra USB 3.0 ports, G-Sync, 144Hz refresh rate, and a user-friendly OSD that can be navigated via the joystick at the back of the monitor. The monitor provides full ergonomic support and has one DisplayPort and one HDMI port. The BenQ Zowie XL2730 is the official gaming monitor for numerous popular eSports tournaments for video games such as CS: GO, Overwatch, Battlefield 1, etc. It offers a smooth and fluid performance thanks to the 144Hz refresh rate, ultra-low input lag, 1ms response time, and its many unique features such as the Black eQualizer for better visibility in dark scenes and the Blur Reduction which function like Nvidia’s ULMB. This monitor also has FreeSync, although it’s not officially stated on BenQ website. Besides providing the professional competitive players with a flawless performance, the BenQ Zowie XL2730 FreeSync display also offers full ergonomic functionalities, plenty of connectivity options including a VGA, a DVI-DL, two HDMI, a DisplayPort 1.2, headphones jack, and a microphone jack. It also has a device dubbed the S. Switch which allows you to effortlessly navigate through OSD settings in order to quickly swap picture presets and other features. Moreover, you can download the picture settings that were created by professional players and apply them to your own screen or store them on a USB flash. For those with a tighter budget, the BenQ Zowie XL2720 is an excellent alternative for an eSports tournament monitor. 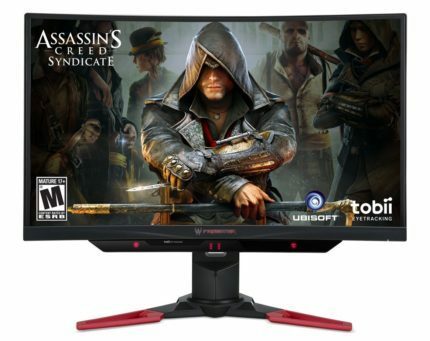 Besides the lesser 1080p resolution, this monitor also lacks a microphone jack, the FreeSync technology, and the Color Vibrance feature which can slightly enhance image quality. The Eizo Foris FS2735 is the very first monitor to include the built-in Bluetooth connectivity which allows you to use your mobile device to accept phone calls, use it as a remote, and receive notifications on-screen whether you have Android or iOS. Apart from this unique and convenient feature, the Eizo FS2735 FreeSync monitor also delivers the impeccable performance, vibrant image quality, and a plenty of additional features. The combination of FreeSync, quick 4ms response time and the boisterous 0.05-frame input lag (~0.35 milliseconds) offers an immersive and responsive gameplay in any genre while the image quality exceeds expectations thanks to the accurate colors of the IPS panel. There is a lot of connectivity options including a DisplayPort 1.2, two HDMI, one DVI-DL, and two USB 3.0 ports. The additional gaming features include the Smart Insight Demolition for better visibility in dark scenes, the G-Ignition which allows you to import custom picture settings from other players, and a Motion Blur Reduction feature. 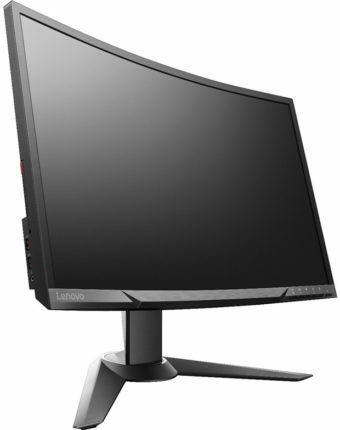 The Lenovo Y27F is one of the most affordable 27-inch monitors with a curved 1800R screen, 144Hz refresh rate, and a crystal-clear VA panel. The sleek design also includes the headphones hook, VESA mount compatibility, and the tilting ability. There is one DisplayPort, one HDMI, and four USB3.0 ports as well as an audio jack. 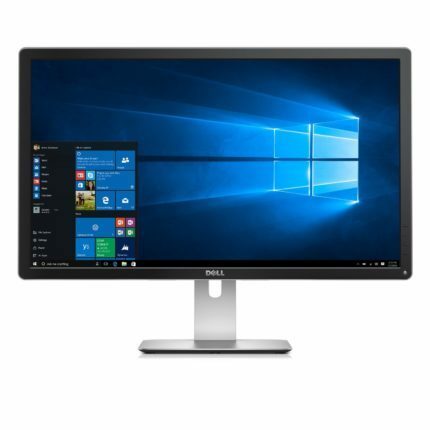 Overall, this is an amazing monitor for the money since it offers a superb image quality with 3,000:1 contrast ratio and a smooth performance thanks to the high refresh rate, FreeSync, and quick 4ms response time. Furthermore, since it features 1080p resolution, it doesn’t require a demanding computer gear to push maximum settings, but the viewing experience exceptionally immersive. There’s also a G-Sync version of this monitor, the Lenovo Y27G which features the exact same specifications except for the adaptive sync; however, it costs an additional $150. Unless you already have an expensive and powerful Nvidia graphics card, the G-Sync isn’t worth it as you could invest in a better graphics card instead. The AOC Agon AG271QG is just as amazing as our title-holders in the list thanks to its smooth performance and image quality, yet it is up to $150 cheaper. All the key specifications are present including G-Sync, the 144Hz refresh rate that you can overclock to 165Hz, 1440p resolution, and a crystal-clear IPS panel for vibrant colors. The response time of 4ms along with an exceptionally low input lag makes for a fluid gaming experience with minimal perceptible ghosting of the fast moving objects. The connector ports include an HDMI 2.0, a DisplayPort, four USB 3.0 ports, the headphones jack, and a microphone jack. The modern design offers VESA mount compatibility, full ergonomic support, and 2x2W built-in speakers. Moreover, the bezel of the AOC AG271QG G-Sync monitor amounts to only 11 millimeters in width which makes the picture pop out. The screen is coated with an anti-glare 3H coating for the elimination of the sunlight reflection. The exclusive gaming features include the AOC Shadow Control for better visibility in the dark, gloomy scenes and the AOC Game Control which provides you with advanced settings for color saturation and gray levels. In comparison to the Acer XB271HU and the ASUS PG279Q, the AOC AG271QG performs equally well while the image quality is slightly inferior but still excellent, even more so after proper calibration. 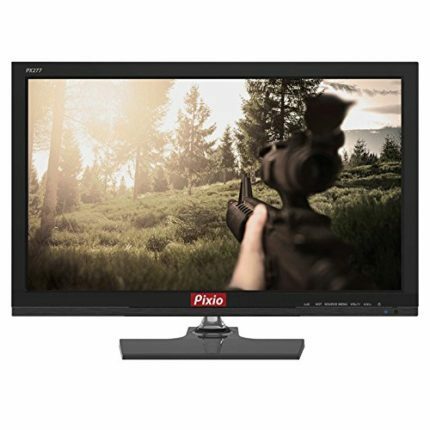 Meet the Pixio PX277, the most affordable 27-inch gaming monitor with a 144Hz refresh rate, 1440p resolution, FreeSync, and an IPS panel with 4ms response time and 100% sRGB color gamut. Additionally, it offers plenty of connector options including a DisplayPort, a mini-DisplayPort, two HDMI, a Dual-Link DVI, and an audio line-in for the 2x5W built-in speakers. The design includes a somewhat thick bezel which can easily be neglected after considering the price tag. The monitor can be tilted and it’s VESA mount compatible, but cannot be height adjusted, pivoted, or swiveled. It has an anti-glare protection, it’s flicker-free, and has a blue light filter, so you can play for hours to an end without straining your eyes. Gaming features include the Game Mode which automatically brightens up the dark scenes and the LoS feature which allows you to place a custom crosshair on the screen. In addition, the monitor offers Picture in Picture and Picture by Picture modes. Overall, the flawless gameplay experience thanks to the FreeSync and 144Hz in addition to the crisp 1440p resolution and vibrant image quality make the Pixio PX277 IPS display the best monitor for the money. This concludes the list of 144Hz gaming monitors, now we’ll go into lower refresh rate gaming monitors as well as into monitors for the professional and everyday uses. If you still think you haven’t found the perfect gaming monitor, you can check our list of monitors arranged by refresh rate or our list of all the best gaming monitors available. So, if you’re not looking for a 144Hz gaming monitor but rather a more affordable display, the Dell SE2717H will certainly appeal to you. Not only is this monitor one of the most affordable 27-inch screens out there, it’s also one of the most beautifully designed monitors. Moreover, it offers FreeSync technology with 48-75Hz dynamic range. For those who cannot push 1440p, 144Hz, or any of the two, but want a 27-inch screen for smooth casual gaming and immersive movie watching and multimedia use, this monitor has it all to meet those demands. 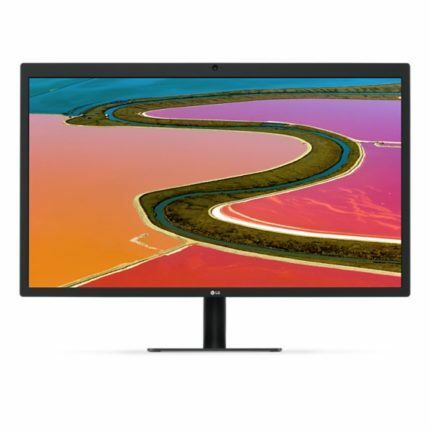 This Full HD resolution monitor features an IPS panel with accurate and vibrant colors, the impeccable 178-degree viewing angles, and a solid 6ms response time speed. The display features a blue light filter and a flicker-free screen which allows you to watch the screen for hours to an end without feeling eye fatigue. The Dell SE2717H 1080p monitor has only one VGA and one HDMI port which is a shame as a DVI port instead of the VGA would be a much better option, but these two connectors are sufficient anyway. The classy and elegantly slim design consists of glossy black bezels while the screen has a matte finish. The only drawback is the limited ergonomics since only the screen can be adjusted by tilting and it has no VESA mount. Alas, considering the price of the monitor and its features, the connectivity and ergonomic drawbacks are negligible. A step up from the previous monitor in terms of image quality but still within the budget-friendly range is the ASUS PB278Q. In comparison to Full HD, the 1440p resolution monitors provide you with 77% more desktop screen space and more vivid details. This panel has no adaptive-sync and it’s limited to 60Hz, but it focuses on image quality as its PLS panel covers 100% of the sRGB color gamut making it the best 27-inch monitor for photo editing under 400 USD. The PLS panel is nearly identical to the IPS except that’s a little bit more affordable. The ASUS PB278Q PLS monitor offers a quick 5ms response time and 178 degrees viewing angles which is as good as any IPS panel monitor. 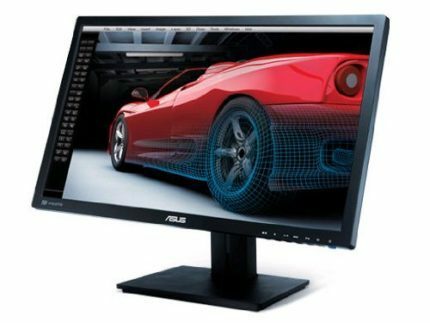 Besides the flawless image quality, affordable price, and seamless performance, the ASUS PB278Q monitor offers extensive connectivity and ergonomic options. Connector ports include a VGA, an HDMI, a DisplayPort, and a Dual-Link DVI, there are 2x3W built-in speakers as well. The monitor has full ergonomic support including the abilities to pivot, tilt, height adjust, swivel, and it’s VESA mount compatible. Some unique features include the QuickFit Virtual Scale feature which allows you to place a virtual grid on the screen to more easily format your documents, photographs, etc. Lastly, there are several pre-calibrated picture presets that you can swap between using the monitor’s hotkey. 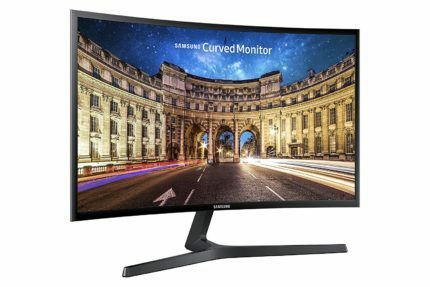 For those who long for an affordable 27-inch curved monitor, there’s the Samsung C27F398. This monitor offers a panoramic 1800R curvature for an immersive viewing experience no matter if you’re working, watching movies, or playing video games. Furthermore, the Samsung CF398 PC monitor has a VA panel with superior 3,000:1 contrast ratio for a brilliant image quality with expressive colors. It is limited to 60hz but offers FreeSync technology for a smooth gameplay experience if you’re an AMD user. Other panel specifications include 4ms response time and 178-degree viewing angles. The design consists of a steady T-shaped base, a matte finish screen, and a 0.5-inches thin profile. It is VESA mount compatible with the 75 x 75mm pattern and the screen can be tilted by -2, 22 degrees, but there are no other ergonomic functions available. Overall, this panoramic monitor provides a vibrant image quality and a fluid performance no matter the activity on the screen, and it looks simply awesome. Until the ground-breaking 144Hz 4K gaming monitors are released, the Acer Predator XB271HK will hold the throne for the best 4K gaming monitor. Even when they are released, the Acer XB271HK 4K monitor will stay relevant as no graphics card can push beyond 60FPS in video games yet, anyway. It may be significantly more expensive than the other 4K monitors, mostly because it features G-Sync, but without the help from the adaptive-sync, you won’t be able to enjoy a smooth gameplay experience. Keep in mind that even with one of the most powerful graphics cards, for example, the Nvidia Geforce GTX 1080, you won’t be able to run most of the latest games at maxed settings and steady 60 FPS. Nonetheless, 4K image quality in video games looks otherworldly while the gameplay is mesmeric even below 60 FPS and with lower effects and anti-aliasing. Besides offering you the impeccable gaming experience, the Acer XB271HK gaming monitor features an IPS panel with 100% sRGB color space coverage, 4ms response time, and the impeccable viewing angles. It has full ergonomic support including the VESA mount compatibility. In order to provide the 4K resolution at 60Hz, the XB271HK has a DisplayPort 1.2 and an HDMI 2.0 port. Other features include four USB 3.0 ports, 2x2W built-in speakers, and the common gaming features from the Predator series such as the FPS counter, timer, and the custom crosshair overlays. With G-Sync enabled, the Acer Predator XB271HK is even capable of reaching up to 75Hz, within the 24-75Hz dynamic range. 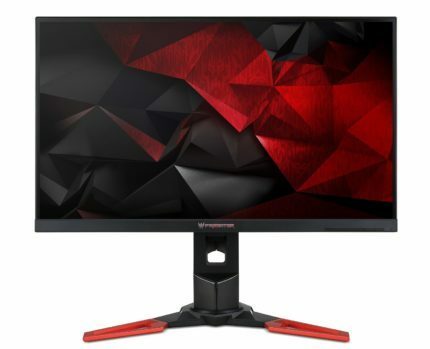 This is where the G-Sync versus FreeSync difference gets serious, the ViewSonic XG2700-4K is available for $330 lesser price tag than the Acer Predator XB271HK due to the adaptive-sync technology. The ViewSonic XG2700-4K also features an IPS panel with 10-bit (8-bit + FRC) color support and 178-degree viewing angles. However, its color gamut amounts to 98% sRGB and 70% Adobe RGB while its response time speed is 5ms. It has full ergonomic support and extensive connectivity options including four USB 3.0, a DispalyPort, a mini-DisplayPort, two HDMI 1.4 with MHL support, and an HDMI 2.0. It also features 2x3W built-in speakers as well as some exclusive features such as the Black Stabilization for better visibility in the dark scenes, PiP and PbP modes, and a flicker-free screen. In comparison to the Acer XB271HK, it offers nearly identical image quality and performance, that is until the adaptive-sync is taken into the equation. While the XB271HK offers generous dynamic range starting from 24Hz, the lower end FreeSync range of the ViewSonic XG2700-4K amounts to 40Hz. This means that if your computer equipment cannot reach 40Hz, you will have no use of FreeSync whatsoever, so keep that in mind. On the other hand, if you were to opt for the 4K G-Sync display instead, you’d have to invest another $330 for the monitor, and twice as much for a fitting graphics card, but you’d be able to enjoy state-of-the-art image quality and performance. 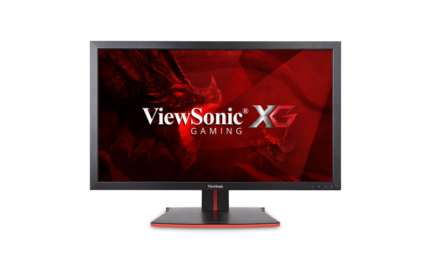 Even if you cannot benefit from FreeSync, but want a 27-inch 4K gaming display, the ViewSonic XG2700-4K is your best choice for the money, as it costs less than most of the 4K displays without FreeSync. 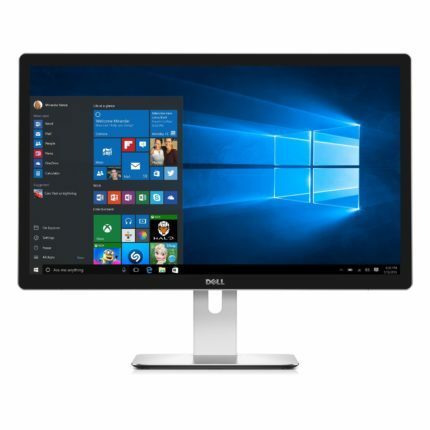 The Dell P2715Q has significantly dropped in price not so long ago, making it an ideal choice for the professional designers and photographers looking for a 4K display. The monitor covers over 99% of the sRGB color space and 79% of the Adobe RGB; it’s factory color calibrated to Delta E < 2 and comes with the calibration reports. Naturally, the Dell P2715Q features an IPS panel for uniform, consistent, and precise colors supporting 10-bit color depth. It has full ergonomic support and extensive connectivity options such as four USB 3.0, an HDMI 1.4 with MHL, an audio line-out, a DisplayPort, a mini-DisplayPort, and a DisplayPort-Out for seamless daisy-chaining. 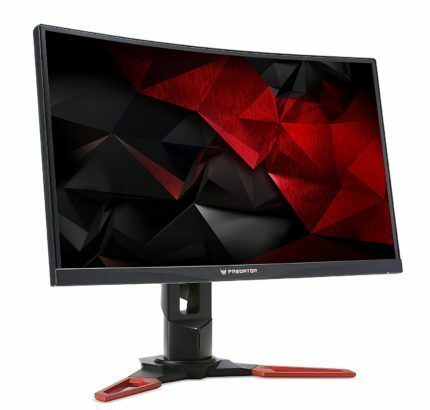 The ViewSonic VP2768 is one of the latest ViewSonic monitors aimed at the professional designers that have already proven flawless performance. The IPS panel offers true 8-bit color depth and 14-bit 3D LUT which provides a palette of 4.39 trillion colors. Color accuracy is factory calibrated to Delta E < 2 and along the monitor, you will get calibration reports for various color spaces. The consistency and uniformity of colors are ensured for the sRGB, EBU, SMPTE-C, and Rec. 709 color spaces across the entire screen, at all times. The ViewSonic VP2768 IPS panel display is also hardware calibration-ready with the optimal ViewSonic Colorbration Kit for effortless calibration depending on the type of color-critical work and offers 6-axis color adjustment. There is a full ergonomic support while the connector ports include two HDMI 1.4, a DisplayPort, a mini-DisplayPort, and a DisppalyPort-Out, as well as four USB 3.0 ports and an audio line-out. 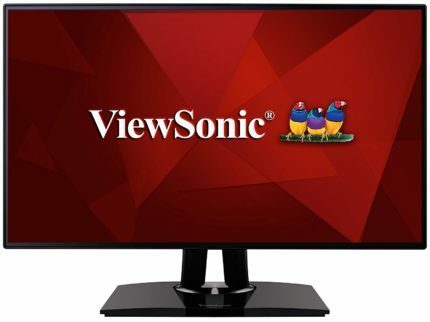 It’s also available with the USB type C port for an extra $40, the ViewSonic VP2771. 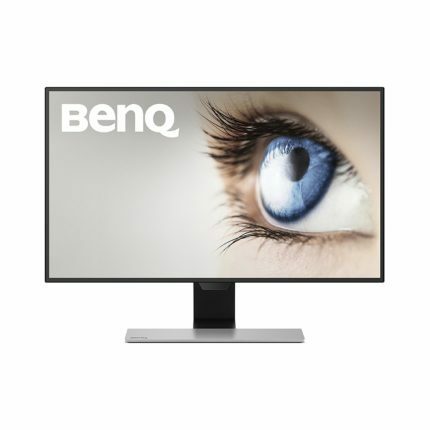 The BenQ EW2770QZ is yet another recently released monitor with excellent performance and image quality as well as an innovative technology. This monitor features the exclusive Brightness Intelligence Plus technology which consists of a built-in sensor that automatically adjusts color temperature and brightness according to the ambient lighting and on-screen content. It’s ideal for offices where people spend many hours looking at the screen. Along with its flicker-free screen, low blue light filter presets for different activities (Web Surfing, Reading, Office), the B.I.+ technology offers the most eye-friendly display to date. Other features include 1440p resolution, true 8-bit color depth covering 100% of the sRGB and Rec709 color spaces, and quick 5ms gray to gray response time. The monitor is tilt-only but has VESA mount compatibility. There are two HDMI 1.4a ports, a DisplayPort 1.2, the headphones jack, and 2x2W built-in speakers. The design consists of a gorgeous thin bezel at all four sides while the screen is coated with a light matte protection. The Samsung S27E370D also known as the Samsung LS27E370DS, is the ideal display for those who can’t keep their hands off their smartphones either because of work or pleasure. With the Qi wireless charging base, you can simply connect and put your phone 4cm around the base and it will charge the battery while the phone is always within your reach and sight. Compatible phones include S6, S6 edge, S6 edge+, Note 5 while the Note 3, Note 4, Note Edge, Galaxy S5 and S4 can be charged once they’re equipped with a wireless charging base cover. 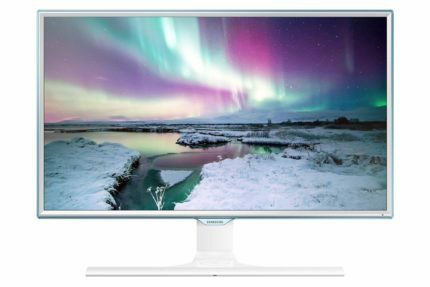 Other specifications of the Samsung S27E370D display include an 8-bit PLS panel with 90% of the sRGB color coverage, 4ms response time, and FreeSync technology. Connector ports include an HDMI, a DisplayPort 1.2, and a VGA. However, the monitor is tilt-only and has no VESA mount compatibility. Overall, it’s a great innovative yet affordable display with a crisp 1080p resolution and a vibrant image quality. Whether you’re a professional graphic artist, animator, or a video editor, the BenQ BL2711U will offer you everything you need to create top high-quality content. The monitor uses AHVA (IPS) panel for the impeccable 178-degree viewing angles and accurate 10-bit colors that cover 100% of the sRGB and Rec709 color space as well as 99% of the Adobe RGB. The BenQ BL2711U monitor offers pre-calibrated picture presets for various different professional tasks. For instance, the CAD/CAM preset provides you with a superior contrast ratio in order to accent 3D color lines while the Animation mode offers greater detail emphasis on dark shadows. Other modes include Video Editing and Graphic Arts. The monitor also includes a light sensor, but unlike the one on the BenQ EW2770QZ model, this one only adjusts brightness and not color temperature depending on the ambient lighting. Other features of the BenQ BL2711U include the DisplayPort for effortless screen splitting, PiP and PbP modes, a flicker-free screen, and a quick 4ms response time for zero ghosting while working. Connector ports are as follows: four USB 3.0, an HDMI 1.4, an HDMI 2.0, a DisplayPort 1.2, and a Dual-Link DVI-D as well as an audio line-out and line-in for the 2x3W built-in speakers. The monitor also has full ergonomic support. 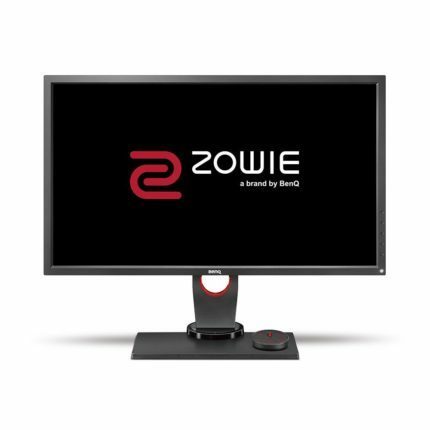 If you’re looking a monitor mainly designed for a gaming console, then the BenQ Zowie RL2755 is for you. It’s compatible with gaming consoles such as Xbox 360, Xbox One, PS3, PS4, Wii, and Wii U but also with your PC. As these gaming consoles max out at 1920×1080 and 60Hz, the BenQ RL2755 offers exactly that. Moreover, it features an 8-bit TN panel with 170 horizontal and 160 vertical viewing angles, the rapid 1ms response time, and ultra-low input lag for the smoothest gameplay experience possible. This eSports display also has the black equalizer feature which increases the visibility in the dark scenes, as well as pre-calibrated picture presets for game genres such as FPS, RTS, and Fighting. 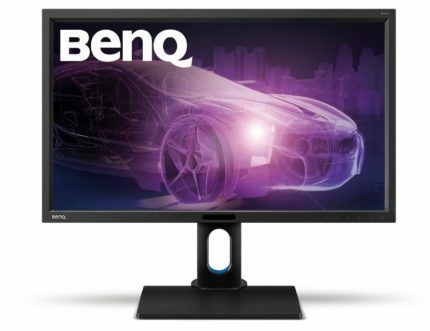 The BenQ Zowie RL2755 monitor is also flicker-free and has a low blue light filter so that you may enjoy countless hours of competitive gaming without straining your eyes. The design includes a headphone hook, VESA mount compatibility, and -5, 20 degrees of tilt. The frame of the display is specifically designed to reduced reflection. The connector ports include two HDMI 1.4, a Dual-Link DVI-D, a VGA, a microphone-in, an audio line-out, and line-in for the 2x2W built-in speakers. Overall, the BenQ Zowie RL2755 is easily the best 27-inch monitor under 300 USD for competitive console gaming. The LG UltraFine 5K also referred to as the LG 27MD5K, delivers the best viewing experience for the MacBook Pro users. The monitor is capable of delivering the stunning 5K resolution, that’s 5120×2880 which at 27-inch screen size provides the fascinating pixel density of 218 pixels per inch. Moreover, it offers a stellar brightness of 500 nits, and a superior contrast ratio at 1,200:1 while the 10-bit color depth support (8-bit + FRC) covers up to 99% of the DCI-P3 color space. Connectivity ports include three USB-C ports and one ThunderBolt 3 which allows for 5K at 60Hz. The Thunderbolt 3 port can simultaneously charge your device up to 85W, transfer data, and stream the 5K video/audio content. The LG UltraFine 5K display also has built-in speakers of 5W each, a 1080p camera at the top bezel, and has no OSD buttons. Its ergonomics include height adjustment by 110mm, tilt by -5, 20 degrees, and VESA mount compatibility. Keep in mind that if you’re a PC Windows user, the resolution will max out at 4096×2304 due to the Thunderbolt 3 port compatibility; a single DisplayPort can’t deliver 5K at 60Hz by itself anyway, which makes the LG UltraFine 5K the best 5K monitor for MAC only. 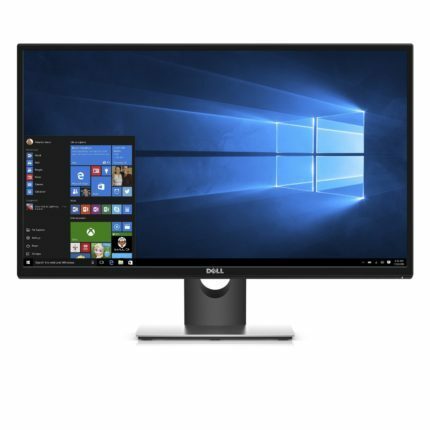 PC users also have a great 5K monitor choice, although it’s a bit more expensive, the Dell UltraSharp UP2715K. The monitor also delivers the stunning 5K resolution at a high pixel density that’s you’ll have to scale between 150-200% depending on the preference. In order to reach 5K at 60Hz, you’ll need to connect two DisplayPorts to your machine. Other connector ports include an additional mini-DisplayPort which maxes out at 4K, four USB 3.0 ports, one of which has fast charging, and an SD card reader. The Dell UP2715K monitor also boasts 2x16W speakers with exceptional sound quality. The IPS panel features true 10-bit color depth, 12-bit 3D LUT, and covers 100% sRGB and 99% Adobe RGB color spaces. The panel has rather chunky bezels, but its edge-to-edge display makes them unnoticeable while the design offers full ergonomic support. These are the best 27-inch monitors available today. There are many monitors scheduled for release this year and some of the most exciting ones are 27 inches in diagonal. We’ll be adding these to the list, and any other we come across that perform satisfactory, as soon as we get a chance to test them. If you think we’ve omitted any great 27-inch monitors and think there are better choices, don’t hesitate to let us know in the comments below! You can also search for each monitor individually on the website for more thorough reviews. Hopefully, we’ve helped you pick your new ideal monitor and we’ll see you the next time you decide to get a new monitor.